Popiah is a popular snack roll in Malaysia. Popiah is a fresh spring roll, usually not fried and eat fresh. A Popiah "skin" is a thin pancake made from wheat flour. The filling is mainly finely grated steamed jicama (yam bean). Other ingredients include carrots and shrimps. Garnished with crushed peanuts, fresh lettuce, bean sprouts, shredded omelet and etc. Prepare filling by heating oil in a wok. Add garlic and shallot, saute until fragrant and color turn golden. Add jicama (yam bean), carrot and saute for around 5 minutes. Stir in dark soy sauce, salt, sugar and pepper powder. Add water and bring to a boil, turn heat down, simmer until all ingredients are cooked and tender, around 20 minutes. Strain (watery fillings might break the popiah skin) and transfer to a bowl and let cool. Starts preparing to wrap the popiah by laying a popiah skin flat on a plate or board. Spread some hoisin sauce and chili sauce on popiah skin. Place 1 or 2 lettuce leaves on top, then 2 or 3 tablespoons of jicama (yam bean) mixture, 1 or 2 shrimps and a few slices of egg omelet. Sprinkle ½ teaspoon of grounded peanut. Fold one side of the popiah skin over the fillings, pull back against fillings tightly, then tuck the left and right edges of the popiah skin in and roll up firmly. Repeat the process to wrap more popiahs. Remember, how much fillings to wrap in the popiah depend on personal preference, just don't stuff the popiah skin too much or it will break. 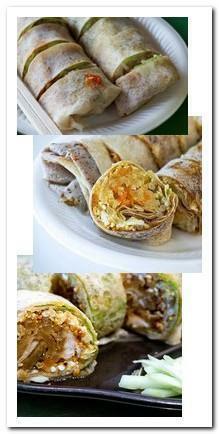 Serve popiah by hand without cutting or cut each popiah into 4 pieces.